Cyclists in the City: Southwark Labour council reverses previous cycling policies, states publicly that fear of motor traffic is what puts people off using their bikes and pledges to change that. About time too. Southwark Labour council reverses previous cycling policies, states publicly that fear of motor traffic is what puts people off using their bikes and pledges to change that. About time too. 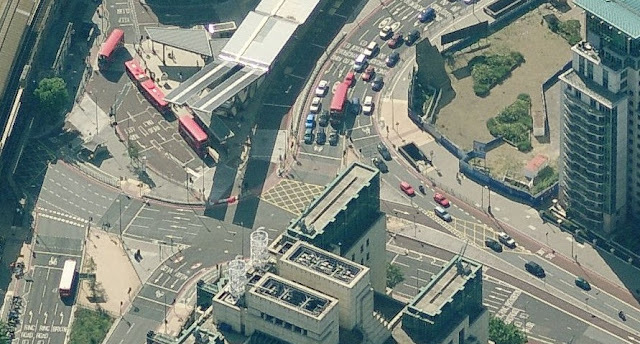 Pictured above, Vauxhall Cross - an urban race track for motor vehicles. Yes, there are bike lanes here but they're fairly substandard. The one over Vauxhall Bridge (bottom right of the picture) is next to five lanes for motor vehicles and is literally as wide as my handle bars. Cycle from Wandsworth towards Oval on the bike track and you have to wait at eight separate bike traffic lights. People in cars, by contrast, only need stop at two traffic lights. If you're on a bike, this junction screams at you that you should get out the way of people who are in motor vehicles. No amount of training makes you feel this is a safe place to use a bike. Last week, Olympic cyclist Nicole Cooke told The Times: "There are also junctions in London that need sorting out to make cyclists less vulnerable. I certainly wouldn’t fancy riding across Vauxhall Cross." But if you're coming from Wandsworth or Stockwell, this is the only way to reach central London and you have no choice but to cycle through it. In that context, I am encouraged by the way The Times is raising the issue of safer cycling in our cities. I noticed in today's edition that David Cameron has committed to support the initiative and Julian Huppert (LibDem) has secured a three hour debate later this month. If you read this blog and think cycling is important, you should write to your MP and ask them to make sure they attend the debate. You can do that by clicking on The Times link here. However, the same edition of today's Times quotes roads minister Mike Penning, who seems to think that cycling is already accounted for in the government's budgets and plans. Note that it isn't Mike Penning who wants a debate about safety for people on bikes, it's the MP for Cambridge, not the MP who is responsible for our roads. Penning talks about how the government is giving billions to local councils to spend on "transport improvements, including measures for cyclists". The reality is the vast majority of that money is going on new or wider roads, on electric car infrastructure and virtually none of it on infrastructure that will help people choose to use their bike rather than their car. The prime minister pledges his support but his minister is simply showing the support is little more than words. Most people don't use bicycles to get from A to B in this country. The reason is simple. Most people look at the roads and think, no chance am I putting myself on a bicycle in the middle of four lanes of motor traffic and then turning right across that junction. As one local councillor put it in Cornwall this week: 'parents told me it was not safe, and that's why many choose to drive'. This is the sort of language that makes sense, nothing like the obfuscation and denials of Mike Penning. It is also a significant shift in tone from the Labour administration at Southwark council. A couple of weeks ago the London SE1 website pointed out how the Southwark councillor responsible for cyclists' safety in the borough said that he would spend his time and money to 'focus on equipping cyclists with the skills to interact with other traffic rather than building a network of segregated routes'. This blog lambasted that intention as utterly out-of-touch and irresponsible. It is encouraging to see that same Labour councillor now supports a proper network where people will feel it is safe and sensible to use a bike. Unfortunately, the Southwark press release also contains a cautionary note which is this: "We are also committed to lobbying Transport for London to ensure that the roads they are responsible for are as safe as possible....nine out of the ten most dangerous junctions on the borough are under the control of TfL." What that means is that Southwark has no power over the big main roads that run through the borough and are controlled by the Mayor, Boris Johnson - places similar to Vauxhall Cross (in Lambeth but controlled by Boris Johnson). Just like David Cameron, London's Mayor has started making the right noises about making London's roads places where people feel they can cycle safely. He announced a junction review late last year and then re-announced it as something new to The Times this week. But the early signs are that Boris is listening but not yet implementing. Over at Euston Circus, the Mayor has announced a consultation on a new junction layout at the top of Tottenham Court Road. This consultation was announced after Boris Johnson had promised 'a step change in the way engineers think when planning road layouts'. Well, they clearly didn't have a step change here. The junction will be reduced from six lanes to three. And people on bikes will be expected to cycle bravely along these extra narrow lanes. "The local police safer neighbourhood team were out on my commute home tonight warning cyclists about breaking the law on Victoria Park Road. They seemed to accept, though, that Hackney Council’s failure to provide safe lanes on an important cycling route was causing scores of cyclists to either put themselves in danger or conflict with pedestrians on the (also inadequate) pavements. I’m also hopeful from my chat with the SNT officer that the police in Hackney are actually already advocating for better infrastructure." I think it's time that London's Mayor demonstrates that his much promised 'cycling revolution' actually has some legs. And he needs to start by actually building the infrastructure to support it. After an outcry by councillors and residents, Southwark's Labour council seems to have realised that too. 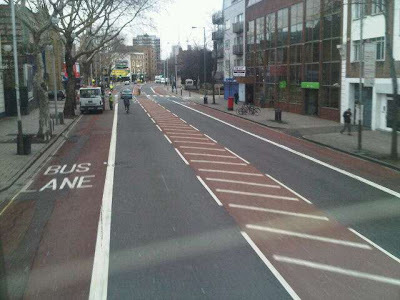 It's not about building segregated bike lanes all over London. It is about building our road infrastructure so that there are plenty of 'safe, cycle routes free of intimidatory traffic for those who travel across the borough by bike'. Provided they get on and build it, then this is absolutely spot-on, in my view. It feels like we might be on the edge of a serious change in official language and attitudes. Well done to all on years of pestering. Fingers crossed (and efforts redoubled). Things might actually start to change. Seeing the word “intimidatory” in an official pronouncement does seem to be a step forward, as it finally recognises the issue of subjective safety, breezily dismissed by our glorious “wits about you” Mayor. Congrats to LB Southwark for that. I don’t subscribe to the view expressed by many, that cycling is “dangerous” per se – the risk of death or serious injury, expressed per unit of time or distance, according to the comparatives you use, does not really show cycling unfavourably compared with other activities such as walking, playing team sports, swimming etc. However, having been forced back on to my two feet by icy conditions at home lately, I have winced repeatedly as cyclists who have passed me have themselves been overtaken at extremely close quarters by aggressive and impatient drivers, and I can only conclude that the cyclists are among those whom Boris had in mind in his Elephant & Castle comment. Of course “objective” statistics are in fact anything but – you might conclude from the reduction of pedestrian road casualties over the years that roads have become safer for pedestrians and cyclists, or you can entirely reasonably conclude that the reductions are actually because the roads have become more dangerous, forcing pedestrians and cyclists to withdraw from them, as apparently Mike Penning MP believes that they should. Speaking of Mr Penning, he should remember what happened to Mr Toad. He also thought that he owned the road, and look where it got him – a prison sentence, a dramatic escape dressed as a washerwoman, and a return home to find his house overrun by squatters. Think about it, Mr Penning: figuratively speaking, the same fate might await you! I think using "intimidated" is useful, it describes much better how biking feels around buses, vans, trucks and taxi drivers etc. Deliberate close passes are at best bullying behaviour, or some other form of harassment. Its a shame that police drivers are some of the worse offenders at this as well, and not surprising that they don't enforce the existing rules that motorists dangerously flout regularly but continue to harass cyclists with red light FPNs instead. I regularly use Vauxhall Cross and at one point did even have a chap on a Brompton comment "I hate this area!" as we sat at the lights to head round towards Stockwell/Clapham. Of course getting there is not for the faint hearted. Given that you need the 3rd lane (counting from the left) off the bridge, which ideally means approaching in the 2nd lane as you come off the south end, it means you are pretty much forced into some rather hair raising lane hopping. Now I'm a fairly confident and quick rider but even I occasionally get a bit nervous doing this! Once the lights go green you then have to contend with the drivers who fail to realize what those dashed lines in the road mean as they weave under the bridge...they are lane markings, meant to show where you are meant to drive between and NOT over! Most drivers work on the "shortest distance is a straight line" or are following their sat navs so well they end up lane switching at the last moment. On a good day I can get over and be heading down in L2 with a green ahead as I come off the bridge. Then just take primary in L3 and keep it centred as best I can between the lines before reaching the lights on the other side of the short tunnel. On a bad day I won't be able to move over properly due to busy lanes and end up having to ride across the ASL then dodge cars. It is supposed to be a joke, but in reality hits the nail on the head: Bikes and vehicles shouldn't have to try to co-exist on shared road space - instead there should be proper separation between them. I think it's worth reading today's copy of the South London Press for the interview with Southwark council leader Peter John on this very subject. In it he talks a little about what this "network of safe routes" might look like. Judging by the messages on Southwark Cyclists Yahoo group, this apparent change of heart is a sham - no moe money has been provided and only about £600k over 3 years is specifically for cycling - not enough to build proper cycle infrastructure. Other figures mentioned eg £4m, include spending on other mwasures which might have a peripheral benefit for cyclists - hardly the same thing.